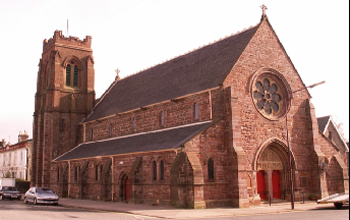 Visitors saw round Helensburgh’s only Grade A listed Church after its 10 year programme of Restoration and Conservation costing some £750,000 financed by the congregation, Historic Scotland, the Heritage Lottery Fund and a number of private charitable Trusts. Sir Robert Rowan Anderson, a pupil of George Gilbert Scott, designed the church and maintained an interest in the subsequent decorative additions. Amongst the important contributors to the cost of its erection in 1867 was William Gladstone. The tiling and the alabaster and mosaic reredos are of particular interest — together with the important collection of beautiful stained glass. Mrs Joan Sadden showed the rich collection of vestments and Martyn Marshall described the organ and gave a short recital. The organ, restored some ten years ago, was built to the design of the foreman to Cavaille-Coll, builder of organs at Notre Dame and St Sulpice, Paris.